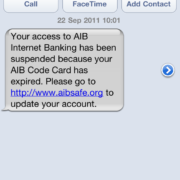 This morning I received a text from ‘AIB’ telling me my code card has expired, Given I don’t have an AIB account this is obviously a fraud. I went to check out the site to see how it looked and its a very good phishing attempt. 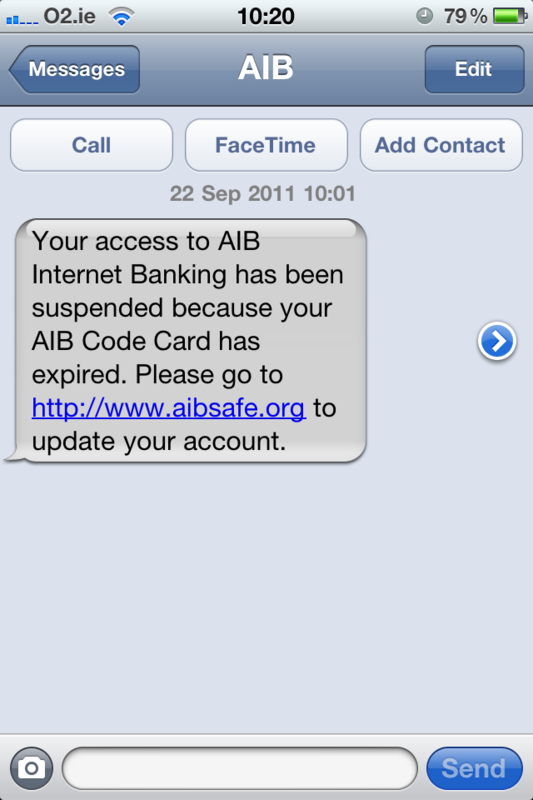 As you can see they have obviously spent time matching AIB’s theme and design right down to showing AIB’s actual phishing alert email address. Secondly the phishing page is asking you to enter your eight digit registration number on a page which is not secure. Below I have the genuine and fraudulent address bars. You can see that the fraudulent site does not have the HTTPS, If the ‘S’ is not in the address bar then don’t ever enter your banking or any secure details.